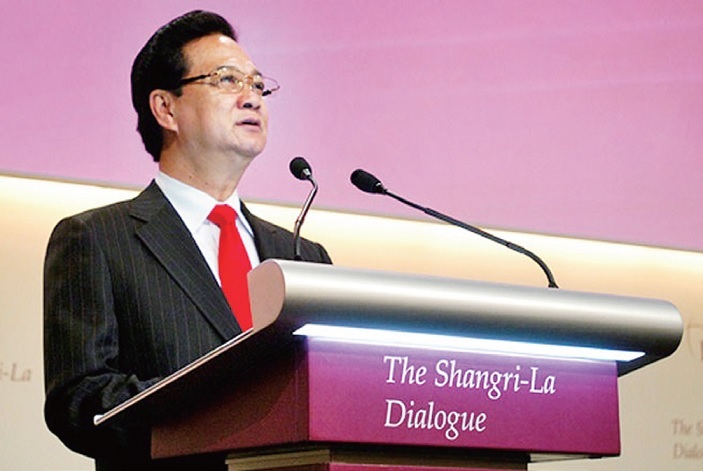 Prime Minister Nguyen Tan Dung delivered a keynote address entitled “Building Strategic Trust for Peace, Cooperation and Prosperity in the Asia-Pacific Region” at the opening ceremony of the 12th Shangri-La Dialogue in Singapore on May 31. 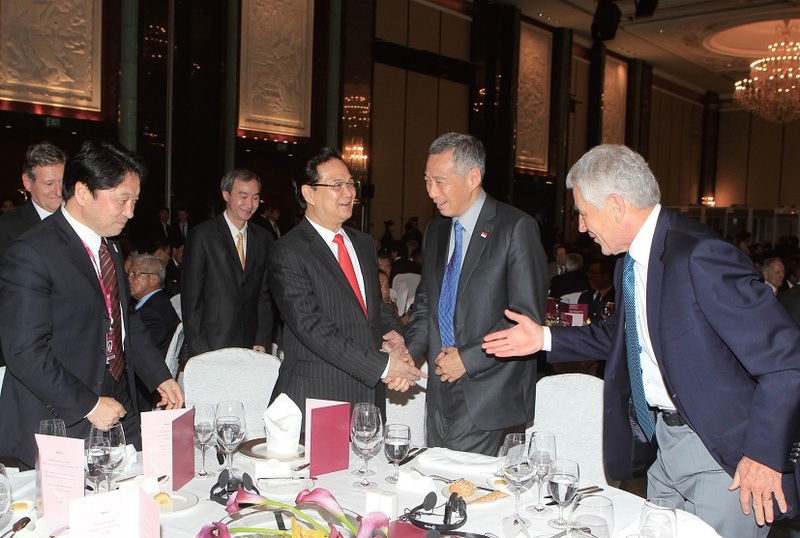 At the outset, I would like to express my sincere thanks to Prime Minister Lee Hsien Loong of the Singaporean host, Dr. John Chipman and the organisers of the 12 th Shangri-La Dialogue for your kind invitation to me to attend and address this important forum. 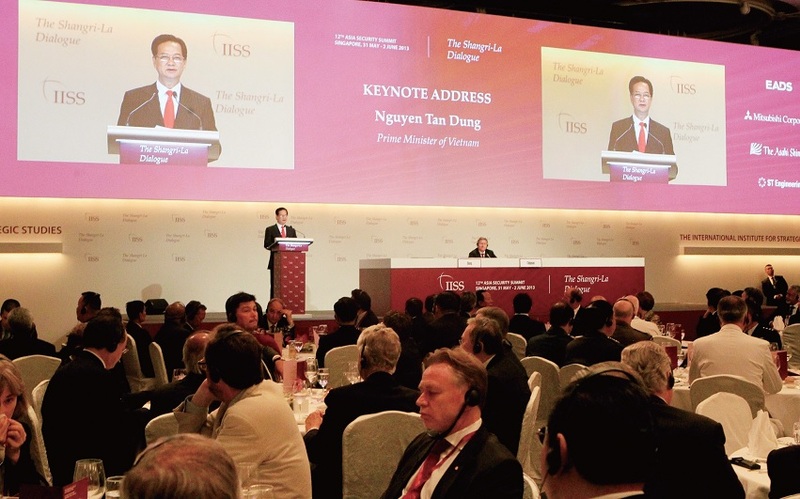 Since its inception 12 years ago, the Shangri-La Dialogue has truly become one of the most substantive and meaningful security dialogues in the region. I do believe that the full presence of government officials, military leaders, prestigious scholars and all distinguished delegates at this forum reflects the interest and the efforts to jointly preserve peace and security in the Asia-Pacific region in the context of a dynamically changing world. I would like to draw your further attention to the fact that maritime transport and communications are growing in scale and having a much greater significance. It is projected that three fourths of global trade will be made via maritime routes and two thirds of that will be shipped across the East Sea . A single irresponsible action or instigation of conflict could well lead to the interruption of such huge trade flow, thus causing unforeseeable consequences not only to regional economies but also to the entire world. In the mean time, the threats of religious and ethnic conflicts, egoistic nationalism, secessionism, violence, terrorism, cyber security, etc. are still very much present. Global challenges like climate change, sea level rise, pandemics or water resources and the interests of upstream and downstream riparian countries of shared rivers, etc. have become ever more acute. We could realize that such challenges and risks of conflict are not to be underestimated. We all understand that if this region falls into instability and especially, armed conflicts, in general there will be neither winner nor loser. Rather, all will lose. Suffice it to say, therefore, that working together to build and reinforce strategic trust for peace, cooperation and prosperity in the region is the shared interest of us all. For Vietnam , strategic trust is perceived, above all, as honesty and sincerity. I believe that no regional country would oppose the strategic engagement of extra-regional powers if such engagement aims to enhance cooperation for peace, stability and development. We could expect more in the roles played by major powers, particularly the United States and China , the two powers having the biggest roles (I underline the biggest) in and responsibilities to the future of their own as well as that of the region and the world. What is important is that such expectation should be reinforced by strategic trust and such strategic trust must be reflected by concrete and constructive actions of these nations. We attach special importance to the roles played by a vigorously rising China and by the United States - a Pacific power. We would expect and support the United States and China once their strategies and actions conform to international law, respect the independence and sovereignty of nations, not only bringing about benefits to them but also contributing genuinely to our common peace, cooperation and prosperity. What I want to further underline is that the existing regional cooperation mechanisms such as the ASEAN Regional Forum (ARF), East Asia Summit (EAS), ASEAN Defence Ministers’ Meetings Plus (ADMM+) as well as the Shangri-La Dialogue offer the opportunities to foster multilateral security cooperation and find solutions to the arising challenges. Yet it could be said that what is still missing, or at least still insufficient, is the strategic trust in the implementation of those arrangements. The first and foremost important thing is to build a mutual trust when confronting challenges, impacts of interactions, and enhancing practical cooperation in various areas, and at different levels and layers, both bilateral and multilateral. Once there is sufficient strategic trust, the enforcement effectiveness of existing mechanisms will be enhanced, and we could advance and expand cooperation and find solutions to any problem, even the most sensitive and difficult one. ASEAN is proud to be an example for the principle of consensus and mutual trust in the making of its own decisions. That principle is the foundation for equality among the member states, whether it is Indonesia with nearly a fourth of a billion people or Brunei Darussalam with less than half a million. That principle also constitutes the foundation for extra-regional countries to place their trust in ASEAN as an ‘ honest broker’ in guiding the numerous regional cooperation mechanisms. With a mindset of shared interests rather than that of a win-lose one, the enlargement of the East Asia Summit (EAS) to include Russia and the United States, the ADMM+ process that was put into reality in Vietnam in 2010, and the success of EAS, ARF and ADMM+ in the years that follow have further consolidated the ground for a regional architecture in which ASEAN plays the central role, bringing about trust in the multilateral security cooperation in the region. Back to the issue of the East Sea , ASEAN and China have travelled a long way with no less difficulty to come to the Declaration on the Conduct of Parties in the East Sea (DOC) adopted during the ASEAN Summit in Phnom Penh in 2002. To commemorate the 10 th anniversary of the DOC, ASEAN and China have agreed to work towards a Code of Conduct in the East Sea (COC). Parties need to uphold their responsibilities, mutually reinforce strategic trust, first and foremost by strictly implementing the DOC and doubling efforts to formulate a COC that conforms to international law and in particular, the 1982 UN Convention on the Law of the Sea (UNCLOS). We believe that ASEAN and its partners can work together to develop a feasible mechanism that could guarantee maritime security and safety and freedom of navigation in the region . In so doing, we will not only help ensure maritime security and safety, and freedom of navigation, and create conditions for the settlement of disputes but will also assert the fundamental principles in maintaining peace, enhancing development cooperation in the contemporary world. Vietnam consistently persists with the foreign policy of independence, self-reliance, multilateralisation and diversification of external relations, being a friend and reliable partner to all nations, and a responsible member of the international community. Vietnam has spared no efforts to build and deepen strategic partnerships and mutually beneficial cooperative partnerships with other countries. It is also our desire to establish strategic partnerships with all the permanent members of the UN Security Council once the principles of independence, sovereignty, non-interference in the internal affairs of each other, mutual respect, equal and mutually beneficial cooperation are committed and seriously implemented. Vietnam ’s defence policy is that of peace and self-defence. Vietnam will not be a military ally to any country and will not allow any country to set up military bases on Vietnamese territory. Vietnam will not ally itself with any country to counter another. In the past years, sustained high economic growth has enabled Vietnam to increase its national defence budget at a reasonable level. Vietnam ’s army modernisation is only for self-defence and the safeguard of our legitimate interests. It does not, in any way target any other country. Once again, Vietnam reiterates its consistent compliance with the ASEAN Six-point Statement on the East Sea and will do its utmost to work together with ASEAN and China to seriously observe the DOC and soon arrive at the COC. As a coastal State, Vietnam reaffirms and defends its legitimate rights and interests in accordance with international law, especially the 1982 UNCLOS.